Using an engaging narrative, this textbook demonstrates how social processes are inherently interconnected by uniquely applying underlying and unifying principles throughout the text. With its comprehensive coverage of classic and contemporary research—illustrated with real-world examples from many disciplines, including medicine, law, and education—Social Psychology 4th Edition connects theory and application, providing undergraduate students with a deeper and more holistic understanding of the factors that influence social behaviors. Each chapter now features 1-2 "culture" boxes, focusing on cross-cultural research on social psychological phenomena. Each chapter now features 1-2 "hot topic" boxes, where we highlight cutting edge and emerging findings. Many references updated throughout, with over 700 new references. A more comprehensive and user-friendly set of online supplementary resources will accompany the new edition. New co-author Heather Claypool of Miami University of Ohio. What makes this book different (and better) than other social psychology texts is the way it is organized around a set of fundamental principles of motivation and cognition. Rather than simply listing and describing the standard topics, the principles provide a framework for integrating them into a consistent and coherent understanding of all social psychology and behavior. This has an enormously positive effect on how the subject can be taught and on how it is understood by students. I use this textbook in my courses because not only is it well-written, it also highlights basic principles and themes rather than focusing on specific phenomena and effects. Rather than discussing each topic in isolation, Smith, Mackie, and Claypool explicitly link them together within and between chapters using these cross-cutting principles and themes. This provides students with a very useful conceptual framework or scaffold with which to understand and integrate what often appears to be an overwhelming amount of information. Many of my students have commented to me that this focus on basic principles was instrumental and valuable in their learning and understanding of the field. This authoritative introduction to the science of social psychology constitutes a high-quality review of the social and social-cognitive processes pertaining to how people perceive and influence other individuals and other groups. Introducing fundamental axioms and core motivational and processing principles to the study of individuals and groups, the book bridges the boundaries between different traditions on how to approach the exciting discipline of social psychology. In this way, the book is a true invitation to the fascinating study of human social behavior and its underlying psychological processes. I have been using this Social Psychology textbook since its first edition. Why? Because it is simply the best. It is thoughtful while still being fascinating. It covers classic research while still being completely up-to-date on new discoveries. It emphasizes ideas while still appreciating the research behind them. And, most important to me, it organizes social psychology in terms of the basic principles that underlie multiple phenomena at the personal, interpersonal, and group levels. Not easy to do…and brilliantly done. This is a book not just for students of social psychology, or of the wider discipline of psychology: it is, rather, a book that speaks to students and practitioners in any field or profession concerned with our social interactions and identities. More than simply an academic textbook, it forms a clear and accessible applied guide for negotiating the complexities of the social world around us. In this new edition, Smith, Mackie and Claypool have continued to build their substantive and cohesive account of social psychology that brings together a range of classic experiments and theories with the most up-to-date research in the field. 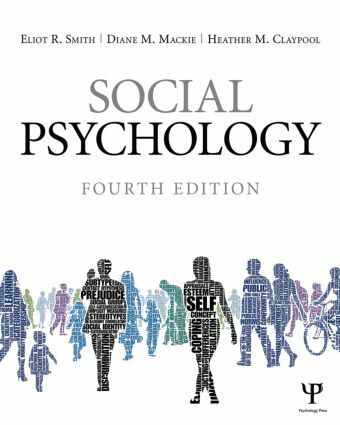 I've used the previous versions of this textbook for years and I think this is an excellent introduction to social psychology. The book offers an integrative approach throughout the chapters that connects them to one another, rather than treating the various research areas of social psychology as disparate and unrelated. In contrast to many other textbooks, the Smith, Mackie, and Claypool textbook pays homage to the work of social psychologists across the globe and contains a separate chapter on social identity. This new edition has been updated and includes recent developments in the field of social psychology. I highly recommend this textbook. What Is Social Psychology?. Asking and Answering Research Questions. Perceiving Individuals. The Self. Perceiving Groups. Social Identity. Attitudes and Attitude Change. Attitudes and Behavior. Norms, and Conformity. Norms and Behavior. Interaction and Performance in Groups. Attraction, Relationships, and Love. Aggression and Conflict. Helping and Cooperation. Eliot Smith is Chancellor’s Professor of Psychological and Brain Sciences at Indiana University, Bloomington. His research interests range widely, including person perception, prejudice and intergroup relations, political and social opinions, and situated and embodied cognition. He has published more than 150 scientific articles and chapters on these and other topics, and his work has been supported by research grants from the National Institute of Mental Health and the National Science Foundation. Professor Smith earned his B.A. and Ph.D. at Harvard University, and before moving to Bloomington held positions at the University of California, Riverside and at Purdue University. Besides this textbook, he has authored Beliefs about Inequality (with James Kluegel) as well as editing Beyond Prejudice: Differentiated Reactions to Social Groups (with Diane Mackie). Among his professional honors are the Gordon Allport Intergroup Relations award in 1998, the Thomas M. Ostrom Award for contributions to social cognition in 2004, the Society of Social and Personality Psychology’s Theoretical Innovation Prize in 2005, and the International Social Cognition Network’s award for the best paper in 2009. He has been chair of a grant review committee at the National Institute of Mental Health, Editor of Personality and Social Psychology Review, and is currently Editor of Journal of Personality and Social Psychology: Attitudes and Social Cognition. These positions have given him tremendous appreciation for the best work in every area of social psychology. Professor Smith is married to Pamela Grenfell Smith, a poet and storyteller. They take great joy in their grown-up children, who share their passions for world music, science fiction, and good cooking, but the big deal for them is their astonishingly accomplished grandchildren, Griffin James Hassett and Iona Beatrice Hassett. Diane Mackie is Professor and Chair of Psychological and Brain Sciences at the University of California, Santa Barbara, where she has been honored with a Distinguished Teaching Award and listed as one of "Ten Terrific Teachers" by UCSB students. Professor Mackie grew up in New Zealand, received her B.A. and M.A. at the University of Auckland, New Zealand, and then worked as a researcher at the University of Geneva, Switzerland. She received her Ph.D. in Social Psychology from Princeton University in 1984. These opportunities to become steeped in both European and North American traditions of social psychology are reflected in her interests in integrating different perspectives and approaches both in her research and in this textbook. The author of more than 100 articles, chapters, and books on persuasion, social influence, group interaction, and intergroup relations, Professor Mackie is also co-editor of Affect, Cognition, and Stereotyping: Interactive Processes in Group Perception (with David Hamilton) as well as Beyond Prejudice: Differentiated Reactions to Social Groups (with Eliot Smith). Reflecting her broad interests, Professor Mackie has served as Associate Editor for Personality and Social Psychology Review, Group Processes and Intergroup Relations, and Personality and Social Psychology Bulletin, as well as on the editorial boards of almost all major social psychological journals. Both the National Science Foundation and the National Institutes of Health have funded her research. Professor Mackie counts among her honors fellow status in the Association for Psychological Science, the Society for Personality and Social Psychology, and the Society for the Psychological Study of Social Issues. However by far her greatest (and busiest) honor is being Mom to college freshman Alex and high school freshman Nico, the two coolest kids on the planet. Heather Claypool is Professor of Psychology at Miami University in Oxford, Ohio. Her research interests focus on how motivation, emotion, and mood influence and are influenced by cognitive processes. Specific topics of study have examined how processing ease (or fluency) shapes social perceptions and behaviors; how feelings of positivity trigger feelings of familiarity; and how feelings of belongingness and a lack of belongingness shape emotions, self-esteem, social perceptions, and social information processing. She has published more than 30 scientific articles and chapters on these and other topics, and her work has been supported by research grants from the National Science Foundation. Professor Claypool earned her Ph.D. at Purdue University in 2002 (where Eliot Smith served as one of her mentors), and then worked as a post-doctoral researcher at the University of California, Santa Barbara (with Diane Mackie). In 2003, she took a position at Miami University in Oxford, OH, where she continues on the faculty today. She has been an Associate Editor for Basic and Applied Social Psychology, is currently an Associate Editor at Personality and Social Psychology Bulletin, and serves on the editorial boards of several other journals. She has also served as a panelist for the National Science Foundation Graduate Research Fellowship Program. Professor Claypool is married to Eric Core, an engineer, and they share a love for travel, tennis, good food, and their two adorable cats, Abby and Murphy.